Army Wives...The strength behind the strong. As the wife of a service member, you are responsible for so many things while your other half is off protecting our freedom that it can be difficult to be apart from your military spouse. 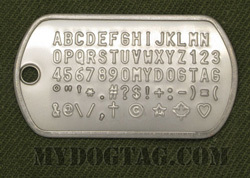 Creating your own set of dog tags is a fantastic way to support and remember your loved one while they are deployed. 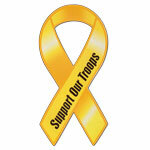 You may also be interested in our Regulation issue Army dog tags, and Long Distance Relationship dogtags. Live each day likes he's deployed tomorrow. Welcome home soldier, now kiss me! Love me while I'm gone. 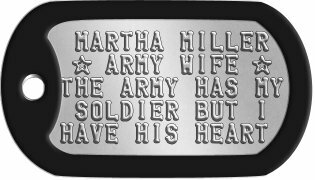 Customize to Buy your Army Wife Dog Tags now! All orders are shipped within 1 business day and are usually delivered within 1 week (in North America). 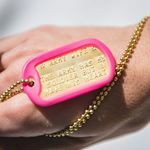 If you need any assistance creating or ordering your Army Wife Dog Tags please contact us directly, we are here to help!